You want an industrial wet coating company that delivers consistent quality. Our customers tell us they are confident we'll deliver the same consistent quality, batch after batch. That's why customers keep coming back to Superior Industrial Coating. You'll appreciate not only the quality of the coating on your parts, but also the fact that you get all of your parts back. We have zero tolerance for shrinkage. Efficient technology and equipment, plus our low-overhead Racine, Wisconsin location, equals quality coating at the best price. Request a quote. You can be sure that your wet coating order will be turned around very quickly. Our state of the art equipment and technology mean higher efficiency. 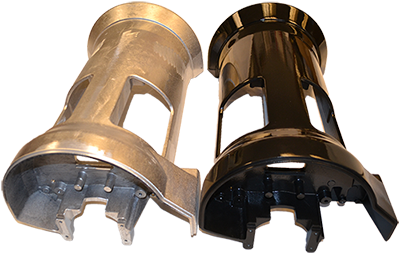 From prep to wet coating, to assembly, and to packaging, we can save you time and money by being your one stop finishing shop. Contact us today. Whatever your industry, Aerospace, Automotive & Transportation, Appliance, Architectural, Agricultural, Electronics & Computer, Furniture, Food Processing, Hardware, Industrial, Lawn & Garden, Lighting, Medical, Marine, Military, Sporting Goods, or any other, we have the right wet coating solution for you. 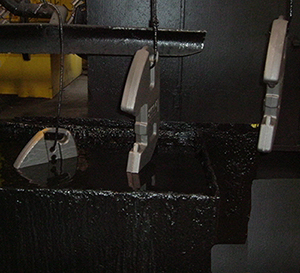 Our six decades of coating experience has allowed us to perfect and utilize the most innovative wet coating solutions. The latest in wet coating technology means a superior finish and better corrosion protection. Allow us to improve the look, durability, and value of your product. Wet coating is the ideal finishing solution for plastics, composites, or any other material that cannot stand the heat necessary for powder coating. Wet coating is also the right choice when exact color match or gloss level are critical. It is a proven method for protecting and aesthetically enhancing structures and fabrications. Wet coating can be applied as a protective and/or decorative coating to almost any part. This coating process can be accomplished with a wide range of manual or automatic spray guns including conventional, 2-component, and electrostatic. Wet coating offers multiple benefits such as; coating any type of substrate, flexibility in color change and easy adjustments prior to application. This allows for a decrease in time, making it extremely cost effective. It also offers a wide range of chemistries including waterborne, hi-solids and 2-component, as well as a wide range of colors in gloss, textured and/or metallic finishes. 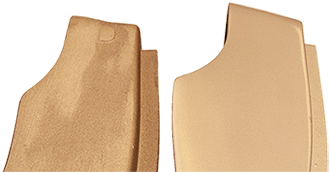 A popular type of Wet Coating is Dip Coating. Dip Coating is the precision controlled immersion and withdrawal of any substance into a reservoir of liquid for the purpose of depositing a layer of material. The speed at which the part is immersed is dependent upon the preferred thickness of paint required per part. As the speed increases more fluid is pulled onto the surface of the part and the time allotted for excess liquid to flow back into the solution decreases. Work with us to get the proper coating thickness for your application. Located in Racine, Wisconsin, we serve customers in Wisconsin and Illinois as well as throughout North America and Europe. At SIC, our expertise in the coating industry enables us to provide the best solutions for your coating challenges. Contact us today to let our coating engineers review your project to determine if wet coating is the right solution for your particular application.